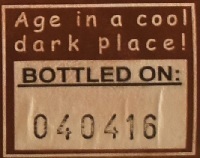 Brewer Description: (from bottle) con.se.cra.tion, n 1. The act of dedication to the service & worship of a deity. 2. The act of giving the sacramental character to the Eucharistic elements of bread and wine. When we made the Toronado’s 20th Anniversary Ale, we had no idea that it would turn out to be one of our favorite barrel aged beers we would ever make. With that said, we have always wanted to make a dark barrel aged beer using 100% Cabernet Sauvignon barrels, but, we never were inspired. That is, until we blended five different beers to make the Toronado beer, the tobacco character from the dark malts blended nicely with the fruit character that developed in blending. 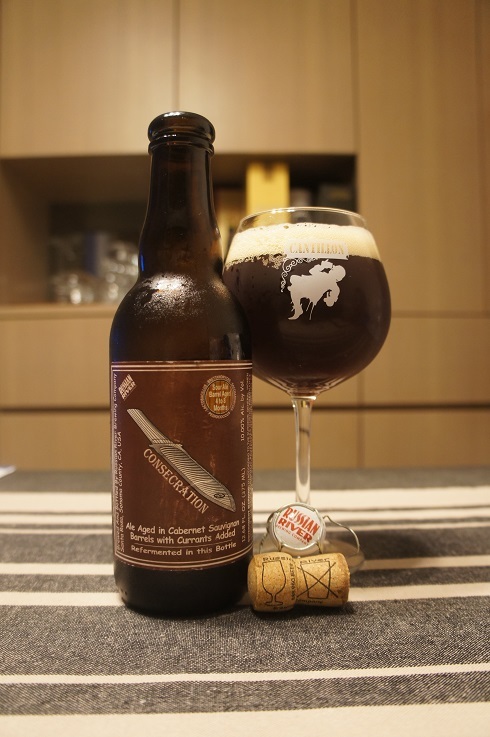 So, with Consecration we set out to make a barrel beer using all Cabernet Sauvignon barrels. Now, we are not saying this is a replica of the T-rooms anniversary beer, after all, a beer like that can never be duplicated, and, there was no fruit added to that beer as there is with this one. 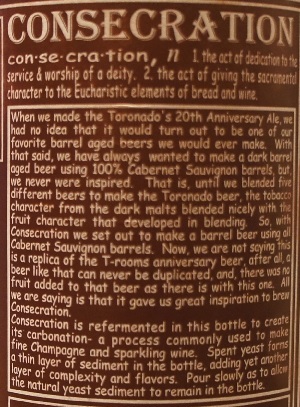 All we are saying is that it gave us great inspiration to brew Consecration. Consecration is refermented in this bottle to create its carbonation- a process commonly used to make fine Champagne and sparkling wine. Spent yeast forms a thin layer of sediment in the bottle, adding yet another layer of complexity and flavors. 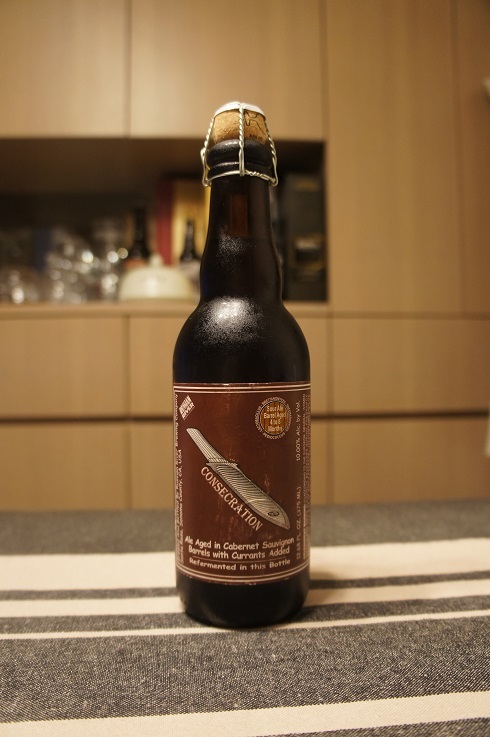 Pour slowly as to allow the natural yeast sediment to remain in the bottle. Intro: A 375ml corked and caged bottle, bottled on 4th April 2016, poured into a Cantillon ballon glass. Appearance: A dark reddish brown colour with a two finger light tan head that dissipated quickly while leaving only slight lacing. Aroma: Lots of oak, cherry, blackcurrant, grape and red wine. Taste: Sweet-ish blackcurrant and cherries followed by sourness, oak, red wine, vinegar and light funk. Overall: This was just like drinking red wine with carbonation. There was no sign of the 10% ABV, and although I thought the aroma was better than the taste, both were still good.